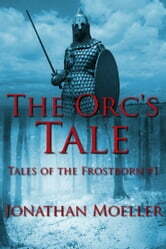 Kharlacht is a young orc of Vhaluusk, betrothed to Lujena, the daughter of the cruel shaman Narrakhan. But to become a full warrior of Vhaluusk, Kharlacht must survive his blood quest…a perilous mission chosen by the tribe’s shaman. And Narrakhan wants him dead. I have read ALL of the Frostborn series, & enjoyed it greatly. But this short story is nothing but a unimaginative, repetitive, quickly thrown together, money making exercise. It is sad that the author would treat his loyal readers with such contempt.